“Someone said my hair is springy and they pulled it today like this – boing, “ my daughter said with tears in her eyes. She demonstrated by pulling her twisted hair and letting it go. She was in kindergarten and just had her first incident with having “different hair.” At that point, at the age of five, she had not thought much about her natural hair at all, but now that it was called to her attention she did not want to be different. Different meant Other. She wanted hair like the other girls in her class. Swinging hair, not springy hair. I heaved a deep sigh. I knew this was coming. I have read to her since she was a baby preparing for this day, books about smart and funny and beautiful black girls with springy hair, but I just didn’t know that it would be so early. I mentioned the incident to her teachers, a black woman and a white man. Both were sympathetic and both understood that this was more than it was. Yes, it was an innocent remark from a child. I mean, my daughter’s hair is springy. It does go “boing” when stretched. The black teacher, who often wore her curly hair in a high ponytail like my daughter’s hair when not in twists, made a big deal of their similar hairstyles – “your hair looks just like mine!” And the class had a healthy discussion about how wonderfully different they all were – and about keeping their hands to themselves. The incident was handled beautifully, but I knew that it would come around again. And it did, and it still does – and the comments are not just from children either. The comments from adults are even more damaging because children are innocent while the adults should know better. Obviously the adults have their own issues, but if they can’t celebrate my daughter as she is, I wish that they would keep their mouths shut. Now at just shy of 12 years old, she has accepted her curly hair. She obsessively reads natural hair care blogs and watches YouTube videos about how to wash it and which products to use. Every other week she prompts me to buy yet another natural hair care product (and there are many on the market now, the industry has figured out that this is as lucrative a market as relaxed hair) trying to find that magic potion that will tame her springy hair. I am happy that she is on the right track, but still chagrined that she tries to contain her hair with clips and bows. She wears it in a low neat bun rather than a high curly ponytail. I show her magazine photos (when I can find them) of black models and actresses with big curly hair, “Isn’t her hair pretty?” I ask. “Surely she sees you as a role model.” This is what people say when I tell them of black-girl-self-esteem hair stories. True, I wear my hair in a natural style and she has not seen me any other way. I loc’d my hair right before her first birthday and wore it in twists before that. But my hair is long. It is not her hair. It hangs and swings. She loves to play with it and twist it in intricate buns, replicating the styles she sees on YouTube. She is often with me when strangers compliment my hair. I am amused by the attention my hair creates – most of the time. The back-handed compliment “your hair is so clean and neat” is not amusing – as if my hair is the exception to the rule. 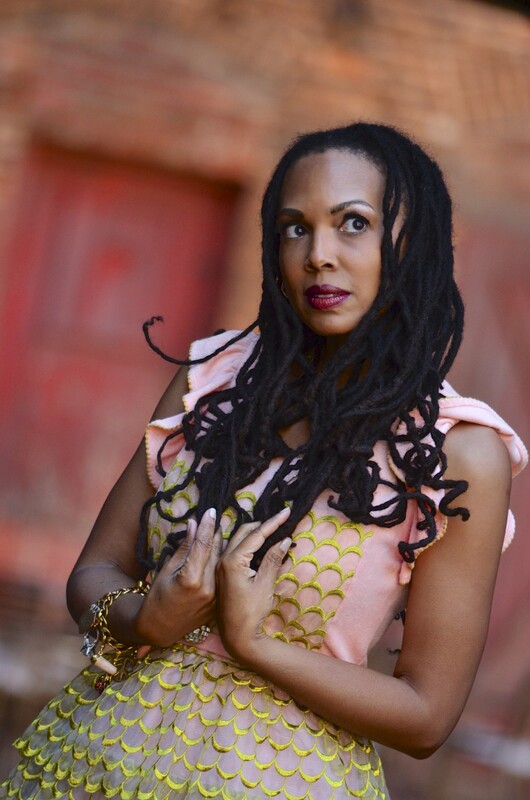 Hampton University’s ban on dreadlocks for business school students is not amusing. The school policy forbidding 7 year old Tiana Parker to attend class while wearing her dreadlocks is not amusing. There are countless ways, subtle and not so subtle that we are told that we must conform to an idealized standard of beauty to be successful and accepted. Really people, lighten up. It’s just hair. Even though our hair is different, I do hope that my daughter sees me as a role model. I hope that she sees that with my hair, my dreadlocked long and lion-like hair, I say to hell with all of that. Everyday that I shop and work and speak and travel and read and exist quite happily with this gorgeous head of hair, I defy the stereotype that I have to conform to a certain standard of beauty. I say nothing, but shout everything, with my hair. 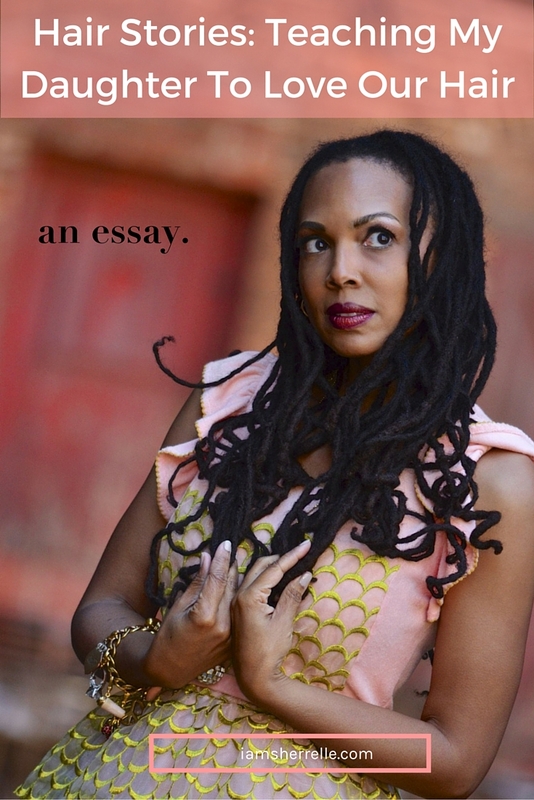 Read more Hair Stories: My Dreadlocks by Elijah Kirkland-Andrews. I love this post and hope many, many more will read it! Diversity should be celebrated. Being a foreigner in the U.S. I take pride in my heritage and have hopes that my children will follow. But it´s a constant battle, especially since they have started school now. Sure enough, it only took couple of weeks of school when I heard my son pronounce/translate his name into English and when I asked why, he whispered “mamma, everyone just speaks English here”. I want my children to be proud of where they came from, not embarrassed – that´s my commitment. I have had this same experience. I am natural and I wear all types of styles rarely with any addition besides when I had braids. I tell me love bug that she is: 1. Smart 2. Beautiful 3. Talented. And we talk about hair, how God made us all different… people with straight hair want it curly and vice versa but the best thing about her hair is that she can do lots of things her white friends can’t and if someone says something not so nice. That just means they haven’t learned to be respectful of others choices. I encouraged her to talk to her friends and cousins who are relaxed. And when she came back this summer from a visit at family’s I have not heard one word about perm…lol she got to smell and see it…being put on her cousin who’s the same age and she was like I am glad you dont put that smell stuff in my hair doesn’t mommy. I do styles she likes to and encourage her to pick styles like puffs, twists and Bantu knits. And her fluffy hair! Enlightenment is a process…And change stats with our children. Since my daughter was born I’ve made an effort to reaffirm her worth. I tell her she’s smart, beautiful, perfect. I write her letters and we lay in her bed at night telling secrets. But far too often I have to guard her against the outside influences of “friends”, music, and TV that tell her she’s not good enough. Her hair is braided in beautiful cornrows and she loves it. But it seems that each day, she needs more and more affirmation from me because someone at school has said something to shake her confidence. Krsytal: ARGHHH!!! How I hate to read this!